Last updated on: 7 January 2019. At the beginning of her grass-court season, Robson played a $100,000 event in Surbiton, but lost in the first round to Marina Erakovic. She then played at Nottingham, but fell to Julia Boserup in the first round. She reached the second round of the Ilkley $100,000 event before falling to Maryna Zanevska in three sets. She received a wildcard for Wimbledon, but lost in the first round to Brazil's Beatriz Haddad Maia. In March 2018, Robson teamed up with Hungarian Fanny Stollár to win the doubles at the ITF event in Yokohama. In July 2018, she underwent hip surgery. ^ "BBC Sport – Laura Robson parts with coach Patrick Mouratoglou". BBC Sport. Archived from the original on 14 July 2014. ^ "BBC Sport – Laura Robson splits from coach Zeljko Krajan after nine months". BBC Sport. Archived from the original on 14 July 2014. ^ Piers Newbery. "BBC Sport – Laura Robson: Miles Maclagan to work with British number one". BBC Sport. Archived from the original on 22 October 2014. ^ a b "Laura Robson swaps coach again and opts for experience with Colombian Mauricio Hadad". Telegraph.co.uk. 6 March 2014. Archived from the original on 10 October 2014. ^ Russell Fuller. "BBC Sport – Laura Robson adds Mauricio Hadad to her coaching team". BBC Sport. Archived from the original on 11 April 2014. ^ a b "Wimbledon diary: Robson's surgery success". The Times. 6 July 2018. Retrieved 11 August 2018. ^ a b "Things you didn't know about Laura Robson, the girl who became a star". The Times. 6 July 2008. Retrieved 7 July 2008. ^ Addley, Esther (5 July 2008). "Never mind Murray. Look out for Laura". The Guardian. Archived from the original on 8 January 2014. Retrieved 5 July 2008. ^ Bevan, Chris (3 July 2008). "Robson flies flag for Britain". BBC Sport. Archived from the original on 1 February 2009. Retrieved 4 July 2008. ^ a b "Laura Robson: The new darling of British tennis". The Sunday Telegraph. 30 January 2009. Archived from the original on 2 February 2009. Retrieved 6 February 2009. ^ a b c d Harman, Neil (7 July 2008). "Newcastle owner could be key to Laura Robson future". The Times. Archived from the original on 12 October 2008. Retrieved 7 February 2009. ^ a b Bierley, Steve (30 January 2009). "Grounded Robson benefits from support as second major final beckons". The Guardian. Archived from the original on 8 January 2014. Retrieved 10 February 2009. ^ a b c Flatman, Barry (1 February 2009). "Laura Robson needs to toughen up". The Times. Retrieved 6 February 2009. ^ a b c d "Juniors – Player Activity: Laura Robson". International Tennis Federation. Archived from the original on 2 March 2009. Retrieved 8 March 2009. ^ "Draws – Girls' Singles". wimbledon.org. Archived from the original on 20 May 2009. Retrieved 5 February 2009. ^ a b Newbery, Piers (5 July 2008). "Briton Robson wins girls' title". BBC Sport. Archived from the original on 2 February 2009. Retrieved 8 March 2009. ^ Harman, Neil (4 July 2008). "Spice girl Laura Robson moves into Wimbledon semifinal". The Times. Archived from the original on 4 September 2008. ^ Watterson, Johnny (9 July 2008). "Reality will soon dawn for rising star". The Irish Times. Archived from the original on 10 October 2008. Retrieved 5 February 2009. ^ a b Cheese, Caroline; Birch, Paul (7 July 2008). "What now for Laura Robson?". BBC Sport. Archived from the original on 31 January 2009. Retrieved 5 February 2009. ^ Hodgkinson, Mark (20 December 2008). "Laura Robson is a doubt for Australian Open". The Daily Telegraph. Archived from the original on 11 February 2009. Retrieved 8 March 2009. ^ "Young Sports Personality: The top three". BBC Sport. 28 November 2008. Archived from the original on 18 January 2009. Retrieved 18 February 2009. ^ "Sports Personality 2008". BBC Sport. 14 December 2008. Archived from the original on 18 February 2009. Retrieved 18 February 2009. ^ "Australian Open 2009 Draws – Girls' Singles". australianopen.com. Archived from the original on 15 March 2009. Retrieved 8 March 2009. ^ "Robson reaches Aussie Open final". BBC Sport. 30 January 2009. Archived from the original on 2 February 2009. Retrieved 8 March 2009. ^ "Pervak downs Robson in girls' singles decider". australianopen.com. Archived from the original on 13 November 2010. Retrieved 8 March 2009. ^ Maul, Rob (15 February 2009). "School comes first for our young stars". The Times. UK. Retrieved 15 February 2009. ^ Harman, Neil (2 April 2009). "Andy Murray backs Laura Robson to handle growing pains". The Times. UK. Retrieved 7 April 2009. ^ "Robson loses Aussie girls' final". BBC News. 30 January 2010. Retrieved 7 May 2010. ^ "Wimbledon 2010: Laura Robson suffers semi-final defeat". The Daily Telegraph. 2 July 2010. Archived from the original on 1 March 2014. Retrieved 13 July 2013. ^ "$10,000 Limoges 2008". International Tennis Federation. Archived from the original on 5 June 2011. Retrieved 8 March 2009. ^ a b "Robson safely into LTA semi-final". BBC Sport. 26 September 2008. Archived from the original on 1 October 2008. Retrieved 3 February 2009. ^ "Robson makes winning return". Sporting Life. Archived from the original on 29 June 2011. Retrieved 8 March 2009. ^ "$75,000 Shrewsbury 2008". International Tennis Federation. Archived from the original on 5 June 2011. Retrieved 8 March 2009. ^ Hodgkinson, Mark (27 September 2008). "Girls junior Wimbledon champion Laura Robson suffers semi-final loss in Shrewsbury". The Daily Telegraph. Archived from the original on 31 January 2009. Retrieved 8 March 2009. ^ a b c "Robson handed Luxembourg wildcard". BBC Sport. 9 October 2008. Archived from the original on 12 October 2008. Retrieved 9 October 2008. ^ Newman, Paul (9 October 2008). "Robson secures rankings reward". The Independent. Archived from the original on 3 December 2008. Retrieved 5 February 2009. ^ a b "$10,000 Sunderland Drawsheet". International Tennis Federation. Archived from the original on 5 June 2011. ^ Hodgkinson, Mark (9 November 2008). "Laura Robson enjoys her maiden senior title". The Daily Telegraph. Archived from the original on 31 January 2009. Retrieved 8 March 2009. ^ "Robson handed wildcard". Sky Sports. 9 June 2009. Archived from the original on 8 January 2014. Retrieved 13 July 2013. ^ "Robson creates shock at US Open". BBC Sport. 26 August 2009. Retrieved 31 August 2009. ^ "Robson close to US Open qualification". The Independent. UK. 28 August 2009. Archived from the original on 2 September 2009. Retrieved 31 August 2009. ^ "Defeat ends Robson's US Open bid". BBC Sport. 29 August 2009. Retrieved 31 August 2009. ^ Newman, Paul (19 October 2009). "Davydenko masters dogged Nadal". The Independent. Archived from the original on 8 December 2009. Retrieved 10 November 2009. ^ a b c "Laura Robson Results". Women's Tennis Association. Archived from the original on 3 October 2013. Retrieved 8 July 2013. ^ "Robson wins in Minsk". Teletext. 10 November 2009. Archived from the original on 15 November 2009. Retrieved 10 November 2009. ^ "ITF Tennis – Pro Circuit – Player Profile – AREFYEVA, Tetyana (UKR)". International Tennis Federation. Archived from the original on 28 September 2013. Retrieved 13 July 2013. ^ "Robson knocked out in Minsk". Teletext. 13 November 2009. Archived from the original on 16 November 2009. Retrieved 13 November 2009. ^ "Andy Murray and Laura Robson beaten in Hopman Cup final". BBC Sport. 9 January 2010. Archived from the original on 10 January 2010. Retrieved 9 January 2010. ^ Draws – Women's Qualifying Singles – Australian Open Tennis Championships 2011 – The Grand Slam of Asia/Pacific – Official Site by IBM Archived 16 January 2010 at the Wayback Machine. Australianopen.com (30 January 2011). Retrieved 14 June 2011. ^ "Teenager Robson beaten in doubles". BBC News. 27 January 2010. Retrieved 7 May 2010. ^ "Robson climbs to career high ranking". Lawn Tennis Association. 26 April 2010. Archived from the original on 30 April 2010. Retrieved 8 May 2010. ^ "Laura Robson wins Aegon Classic opener in Birmingham". BBC News. 7 June 2010. Retrieved 8 June 2010. ^ Cambers, Simon (18 June 2010). "Laura Robson eyes Wimbledon upset after draw pits her against Jankovic". The Guardian. Archived from the original on 11 August 2016. ^ Newbery, Piers (21 June 2010). "Jankovic defeats battling Robson". BBC News. ^ This Week in British Tennis, Friday 16 July Archived 6 August 2010 at the Wayback Machine Lawn Tennis Association. ^ "Laura Robson hires French coach Patrick Mouratoglou". The Guardian. 28 December 2010. Archived from the original on 26 October 2013. Retrieved 1 August 2011. ^ "Injured Laura Robson out of Australian Open & Fed Cup". BBC Sport. 9 January 2011. Archived from the original on 8 January 2014. Retrieved 8 July 2013. ^ "Wimbledon 2011: Sam Smith on Laura Robson and Heather Watson". BBC Sport. 22 June 2011. Retrieved 1 August 2011. ^ Ornstein, David (22 June 2011). "Wimbledon 2011: Laura Robson wins but Heather Watson eliminated". BBC Sport. Retrieved 1 August 2011. ^ Briggs, Simon (27 August 2011). "US Open 2011: Laura Robson completes British quarter in Manhattan". The Daily Telegraph. Archived from the original on 29 August 2011. Retrieved 30 August 2011. ^ Mitchell, Kevin (29 August 2011). "US Open 2011: Laura Robson advances as Ayumi Morita retires". The Guardian. Archived from the original on 8 January 2014. Retrieved 30 August 2011. ^ "Great Britain defeat Portugal in Fed Cup match". Lawn Tennis Association. Archived from the original on 26 April 2012. Retrieved 3 February 2011. ^ "AEGON GB Fed Cup Team defeat Netherlands". Lawn Tennis Association. Archived from the original on 5 February 2012. Retrieved 3 February 2011. ^ "GB Fed Cup team progress to World Group II play-offs". Lawn Tennis Association. Archived from the original on 8 February 2012. Retrieved 6 February 2011. ^ "French Open: Laura Robson loses to Anabel Medina Garrigues". BBC Sport. 28 May 2012. Archived from the original on 2 June 2012. Retrieved 8 June 2012. ^ "Laura Robson". Archived from the original on 26 June 2012. Retrieved 26 June 2012. ^ "XXV Italiacom Open: Laura Robson beats Roberta Vinci in straight sets". BBC Sport. 13 July 2012. Archived from the original on 13 July 2012. Retrieved 13 July 2012. ^ "Laura Robson beats Carla Suárez Navarro to reach first Tour semi-final". The Guardian. 13 July 2012. Archived from the original on 8 January 2014. Retrieved 8 July 2013. ^ "Laura Robson beaten in semi-finals of Italiacom Open". BBC Sport. 14 July 2012. Archived from the original on 3 September 2012. Retrieved 13 July 2013. ^ "GB Tennis: Laura Robson given late place in women's singles". BBC Sport. 27 July 2012. Archived from the original on 30 July 2012. Retrieved 30 July 2012. ^ "Olympics tennis: Heather Watson & Laura Robson through". BBC Sport. 30 July 2012. Archived from the original on 30 July 2012. Retrieved 30 July 2012. ^ "Andy Murray wins but Heather Watson & Laura Robson lose". BBC Sport. 31 July 2012. Archived from the original on 31 July 2012. Retrieved 31 July 2012. ^ "Andy and Jamie Murray beaten in Olympic tennis doubles". BBC Sport. 28 July 2012. Archived from the original on 30 July 2012. Retrieved 30 July 2012. ^ "Andy Murray & Laura Robson earn Olympic mixed doubles spot". BBC Sport. 31 July 2012. Archived from the original on 2 August 2012. Retrieved 31 July 2012. ^ "Laura Robson". London2012.com. Archived from the original on 16 October 2012. Retrieved 22 September 2012. ^ "Andy Murray & Laura Robson take silver in Olympics final". BBC Sport. 5 August 2012. Archived from the original on 15 August 2012. Retrieved 16 August 2012. ^ "Laura Robson stuns Kim Clijsters in US Open second round". BBC Sport. 30 August 2012. Archived from the original on 31 August 2012. Retrieved 30 August 2012. ^ "US Open: Laura Robson upsets Li Na". Archived from the original on 4 September 2012. Retrieved 1 September 2012. ^ "Laura Robson through to Guangzhou WTA Final". BBC Sport. 21 September 2012. Archived from the original on 23 September 2012. Retrieved 21 September 2012. ^ "BBC Sport – Laura Robson loses to Su-Wei Hsieh in Guangzhou Open final". BBC Sport. Archived from the original on 6 November 2012. ^ "Laura Robson loses to Su-Wei Hsieh in Guangzhou Open final". BBC Sport. 22 September 2012. Archived from the original on 6 November 2012. Retrieved 11 July 2013. ^ "HP Japan Women's Open Tennis 2012 – Ladies Singles Draw" (PDF). Women's Tennis Association. 10 October 2012. Archived from the original (PDF) on 20 October 2012. Retrieved 10 October 2012. ^ "Players – WTA Tennis English". Women's Tennis Association. Archived from the original on 3 October 2013. Retrieved 11 July 2013. ^ "SJA2012: The contenders. Who gets your vote?". sportsjournalists.co.uk. Archived from the original on 6 November 2012. Retrieved 20 October 2012. ^ Watson and Robson honoured in London Archived 23 April 2013 at the Wayback Machine 10sballs.com. 9 November 2012. Retrieved 26 November 2012. ^ 2012 William Hill Sportswoman of the Year formstack.com. Retrieved 26 November 2012. ^ "WTA Player Awards: The Fan Favorites & More". Women's Tennis Association. 30 November 2012. Archived from the original on 17 December 2012. Retrieved 6 December 2012. ^ "2013 Results". CBSSports.com. Archived from the original on 9 October 2014. Retrieved 18 January 2013. ^ "Fed Cup – Player Profile – Laura Robson". Fed Cup. Archived from the original on 30 April 2013. Retrieved 8 July 2013. ^ "Laura Robson & Lisa Raymond lose Miami doubles final". BBC Sport. 31 March 2013. Archived from the original on 7 May 2013. Retrieved 8 July 2013. ^ Briggs, Simon (21 April 2013). "Laura Robson's surprise defeat sees Great Britain lose to Argentina and end Fed Cup World Group hopes". The Telegraph. Archived from the original on 2 May 2013. Retrieved 1 June 2013. ^ "Laura Robson beats Agnieszka Radwanska at Madrid Open – Tennis News – ESPN.co.uk". ESPN.co.uk. Archived from the original on 13 May 2014. ^ "Laura Robson beaten in tiebreak by Ana Ivanovic at the Madrid Open". Telegraph.co.uk. 8 May 2013. Archived from the original on 9 May 2013. ^ "Roger Federer falls to fifth in world rankings after Wimbledon exit". BBC Sport. Archived from the original on 9 July 2013. ^ "Laura battles through in carlsbad". laura-robson.net. Archived from the original on 8 October 2014. ^ "Carlsbad comes to an end". Southern California Open. Archived from the original on 7 August 2013. ^ "Laura Robson pulls out of the Rogers Cup". BBC Sport. Archived from the original on 6 August 2013. ^ "Laura Robson books place in second round". BBC Sport. 26 August 2013. Archived from the original on 29 August 2013. Retrieved 29 August 2013. ^ "Laura Robson v Caroline Garcia LIVE". BBC Sport. 29 August 2013. Archived from the original on 30 August 2013. Retrieved 29 August 2013. ^ "US Open 2013: Li avenges 2012's loss to Robson". sportskeeda.com. Archived from the original on 11 March 2014. ^ Mitchell, Kevin (17 April 2014). "Laura Robson out of Wimbledon and French Open with injured wrist". TheGuardian.com. Archived from the original on 2 April 2015. Retrieved 25 March 2015. ^ "Laura Robson targets Australian Open in January as she recovers from wrist surgery". SkySports.com. 20 June 2014. Archived from the original on 2 April 2015. Retrieved 25 March 2015. ^ "Former British No 1 Laura Robson withdraws from French Open". Sky Sports. 6 May 2015. Archived from the original on 10 March 2016. Retrieved 21 June 2015. ^ Briggs, Simon (12 February 2015). "Laura Robson forced to delay comeback from wrist injury". Telegraph.co.uk. Archived from the original on 25 March 2015. Retrieved 25 March 2015. ^ "Laura Robson declines Miami Open qualifying wildcard". BBC Sport. BBC. 15 March 2015. Archived from the original on 18 March 2015. Retrieved 25 March 2015. ^ Cambers, Simon (20 June 2015). "Laura Robson looks ahead despite Daria Gavrilova's easy Eastbourne win". The Observer. Archived from the original on 21 June 2015. Retrieved 21 June 2015. ^ "Wimbledon 2015: Laura Robson given wildcard". BBC Sport. 21 June 2015. Archived from the original on 24 June 2015. Retrieved 30 June 2015. ^ "Wimbledon 2015: Heather Watson through but Laura Robson out". BBC Sport. 30 June 2015. Archived from the original on 1 July 2015. Retrieved 30 June 2015. ^ "Kerber crushes erratic Robson". Wimbledon. 27 June 2016. Archived from the original on 14 August 2017. Retrieved 21 June 2017. ^ "Laura Robson: Ex-British number one wins Koser Jewelers Challenge". BBC Sport. 14 August 2016. Archived from the original on 17 August 2016. Retrieved 17 August 2016. ^ "Laura Robson into US Open qualifying second round". Mail Online. Archived from the original on 29 August 2016. Retrieved 30 June 2017. ^ "US Open: Laura Robson and Tara Moore reach second round of qualifying". BBC Sport. 25 August 2016. Archived from the original on 14 August 2017. Retrieved 30 June 2017. ^ Association, Press (26 August 2016). "Laura Robson qualifies for US Open with win over Tatjana Maria". The Guardian. ISSN 0261-3077. Archived from the original on 14 August 2017. Retrieved 30 June 2017. ^ "US Open 2016: Naomi Broady defeats Laura Robson in battle of the Brits". The Telegraph. Archived from the original on 10 September 2016. Retrieved 30 June 2017. ^ "Laura Robson". WTA. Archived from the original on 9 July 2017. Retrieved 30 January 2018. ^ s.r.o., eHM,. "Tereza Martincova vs. Laura Robson 31.12.2016 – ASB Classic – Auckland – TennisLive.co.uk". www.tennislive.co.uk. Archived from the original on 14 August 2017. Retrieved 30 June 2017. ^ "Australian Open 2017: Laura Robson defeated by Amandine Hesse in first round of qualifying". The Telegraph. Archived from the original on 24 August 2017. Retrieved 30 June 2017. ^ "Andrézieux-Boutheon (ITF) – Brouleau battue, Robson OUT". www.tennisactu.net (in French). Archived from the original on 14 August 2017. Retrieved 30 June 2017. ^ admin (27 June 2017). "Laura Robson". WTA Tennis. Archived from the original on 9 July 2017. Retrieved 30 June 2017. ^ "Laura Robson is back inside the top 200 after winning ITF 60k Kurume tournament". The Independent. 21 May 2017. Archived from the original on 23 May 2017. Retrieved 30 June 2017. ^ "Aegon Surbiton Trophy – Daily round-up | Tennis in Britain". www.lta.org.uk. Archived from the original on 14 August 2017. Retrieved 30 June 2017. ^ "Qualifier Jana Fett causes upset as Brits take to Centre Court | Tennis in Britain". www.lta.org.uk. Archived from the original on 6 August 2017. Retrieved 30 June 2017. ^ "Aegon Ilkley Trophy: Daily updates from Ilkley Lawn Tennis and Squash Club | Tennis in Britain". www.lta.org.uk. Archived from the original on 14 August 2017. Retrieved 30 June 2017. ^ "Wimbledon 2017: Andy Murray to start title defence against Alexander Bublik". BBC Sport. 30 June 2017. Archived from the original on 1 July 2017. Retrieved 30 June 2017. ^ "Australian Open qualifying draws not fair, says Anne Keothavong". fedcup.com. Archived from the original on 2 July 2017. Retrieved 26 January 2018. ^ "Laura Robson: Comeback from hip surgery 'better than expected'". BBC Sport. 13 February 2019. ^ a b Bierley, Steve (30 January 2009). "Robson reaches Australian Open final". The Guardian. Archived from the original on 8 January 2014. Retrieved 6 February 2009. ^ a b Pitt, Nick (6 July 2008). "Laura Robson dazzles with power and poise to win title". The Times. UK. Retrieved 6 February 2009. ^ "Wimbledon 2013: Laura Robson tipped for future glory". Archived from the original on 4 July 2013. Retrieved 25 March 2015. ^ Harman, Neil (26 September 2008). "Laura Robson shows all the right qualities to continue her winning habit". The Times. UK. Retrieved 6 February 2009. ^ Reed, Simon (13 February 2009). "Simon Reed: Serena's Slam hopes". Eurosport. Archived from the original on 18 February 2009. Retrieved 15 February 2009. ^ Cash, Pat (25 January 2009). "Laura Robson: Steady as she goes". The Times. UK. Retrieved 15 February 2009. ^ Skilbeck, John (23 June 2011). "Williams praises rising star Laura Robson". The Independent. Archived from the original on 28 August 2011. Retrieved 1 August 2011. ^ Millard, Rosie (18 June 2013). "My perfect weekend: Laura Robson, British female No 1". The Daily Telegraph. Archived from the original on 22 June 2013. 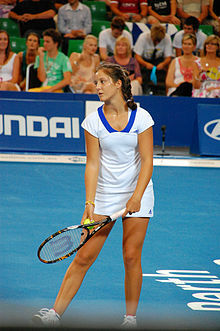 Wikimedia Commons has media related to Laura Robson.